Against the odds of survival WW1 1914-1918 the first American flyer's in the Lafayette Esquadrille risk everything for honor and conquest. The adventurers momentum does not end when the ravages of war and lost friends is over. As sought after undercover agents in the 1920s two X WW1 pilots are taken by the first narcotics division of the U.S. Treasury Department to fight the international Opium trade, their way. From a life of war and assassinations retirement is the ultimate goal. No rest for the weary when the local Civil authorities intermixed with the Klan and its bigotry lead that retirement into revenge through the mountains and rivers of North Carolina. 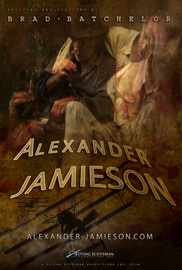 From biplanes to Model A's and guns "Alexander Jamieson" moves from 1914 to 1932 during turbulent times of Asia, Costa Rica and the mountains of North Carolina. Shot in natural light across the U.S., Costa Rica, Malaysia and in the sky with real locations early in the last century's challenges. Filmed at the beginning of the Digital Revolution and ending post production only a few months ago it is representative of how filmmaking has evolved in the last 10 years.